Day 1: Marrakech – Tadart - Telouet – Ait Ben Haddou - Skoura- Dades Valley. Pickup from Marrakech at 7:00 am. We will drive for approximately 2 hours through the Atlas Mountains via the Tizi 'n Tichka pass, stopping for photos along the way, and stopping to have breakfast. We will stop to visit the town of Telouet and its ancient 17th century kasbah. Then, we will drive in the direction of Ourzazate where we will visit the UNESCO protected Ait Ben Haddou Kasbah. We will have lunch here and then visit the Atlas Film Studios. Afterwards, we will drive to Skoura, a town that overlooks many other beautiful kasbahs, in the direction of Dades Valley. The night will be spent at a hotel in Dades Valley. Day 2: Dades Valley – Todhra Gorge – Erfoud – Merzouga – Camel Trek – Desert Camp. After the breakfast, we will drive to Todgha city to explore Todra Gorge, and then go to Tinjdad village where we will stop for lunch. After lunch, we will pass through the towns of Arfoud and Rissani In the direction of Merzouga, home of Erg Chebbi, the tallest sand dunes in Morocco. We will arrive at the hotel in the late afternoon/early evening, where you will have some time to relax by the swimming pool and have berber tea. Around 5:30pm, we will ride the camels from the hotel for about 1h30 through the desert dunes. We will arrive at the berber tents, have some time to relax, drink berber tea with nomads at the camp, enjoy the sandboarding in the dunes, and go over to the dunes to watch the sunset. Dinner will be at the camp, followed by music around the campfire. Overnight in the berber tent. Day 3: Merzouga – Rissani – Draa Valley – Ouarzazate – Marrakech. We will wake up early in the morning to see the sunrise and after you will have time in the camp to enjoy the sandboard if you like it, to have breakfast and take a shower (if you choose the shared tour, shower and breakfast will be at the hotel). 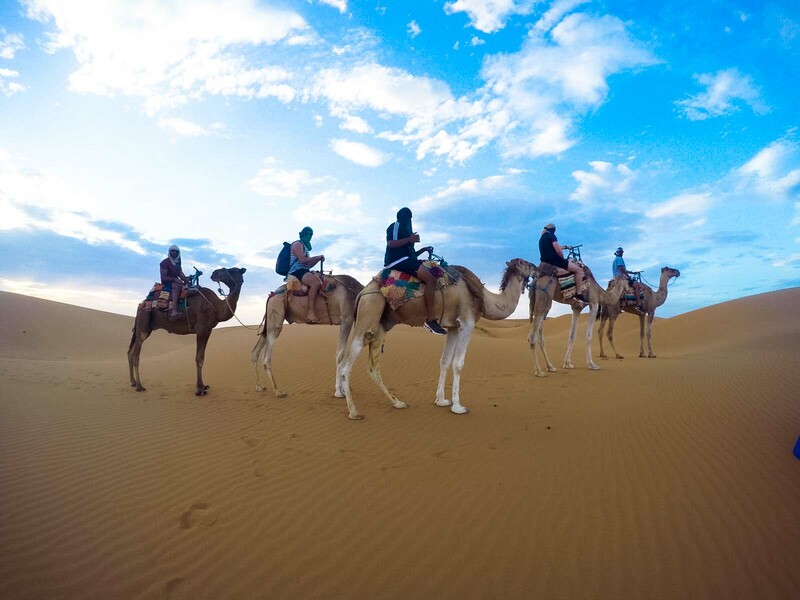 Then we will ride camels back to Merzouga to the hotel for meeting your driver. After that we will come back to marrakech with a stop on the way back for lunch. We will arrive around 7.00pm.